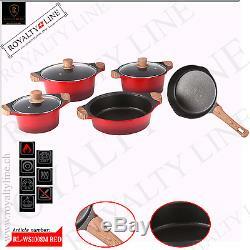 8Pc Marble Coated Cookware set with Wooden Handles. Can be used on Gas, Electric, Ceramic and induction hobs. LIGHT & DURABLE - Forged and shaped. Body creates very light & durable utensil which provides excellent heat conduction between your food and fire. Aluminium is also excellent at resisting the effects of corrosion over time. Furthermore, the thick base design is perfect for maximising heat distribution for even cooking. MARBLE COATED NON-STICK SURFACE - Being naturally non-stick and odourless, the marble coating means less oil and easier cleaning than with traditional ceramic or metal non-stick cookware. Wooden Handles stay cool during cooking. They are ergonomically designed to maximize comfort, stabilization and safety. Frying pan - 28 cm. Shallow Casserole Dish - 28 cm. Casserole Dish with Glass Lid - 20 cm. Casserole Dish with Glass Lid - 24 cm. Casserole Dish with Glass Lid - 28 cm. The item "ROYALTY LINE 8PCS DIE CAST NON-STICK MARBLE COATED PAN SET WOODEN HANDLES" is in sale since Saturday, January 28, 2017. This item is in the category "Home, Furniture & DIY\Cookware, Dining & Bar\Pots & Pans\Pan Sets". The seller is "friendsinternational14" and is located in Bolton. This item can be shipped to United Kingdom, Antigua and barbuda, Austria, Belgium, Bulgaria, Croatia, Cyprus, Czech republic, Denmark, Estonia, Finland, France, Germany, Greece, Hungary, Ireland, Italy, Latvia, Lithuania, Luxembourg, Malta, Netherlands, Poland, Portugal, Romania, Slovakia, Slovenia, Spain, Sweden, Australia, United States, Canada, Brazil, Japan, New Zealand, China, Israel, Hong Kong, Norway, Indonesia, Malaysia, Mexico, Singapore, South Korea, Switzerland, Taiwan, Thailand, Bangladesh, Belize, Bermuda, Bolivia, Barbados, Brunei darussalam, Cayman islands, Dominica, Ecuador, Egypt, Guernsey, Gibraltar, Guadeloupe, Grenada, French guiana, Iceland, Jersey, Jordan, Cambodia, Saint kitts and nevis, Saint lucia, Liechtenstein, Sri lanka, Macao, Monaco, Maldives, Montserrat, Martinique, Nicaragua, Oman, Pakistan, Peru, Paraguay, Reunion, Turks and caicos islands, Aruba, Saudi arabia, South africa, United arab emirates, Ukraine, Chile.